A Letter from Kabwata: Why do missionaries take such embarrassing photos? Thank you Pastor Conrad, makes you wonder why anyone posts such "embarrassing" pictures. It is one thing to poke fun at yourself on occasion another to to make light of others plight. Thanks for sharing this. It's something to be vitally aware of. Every missionary should read this article. Very true. Excellent thoughts on the matter! Hello Pastor Conrad, my name is Dave Hare and I am a missionary in Cameroon. I have received criticism for some of these things from time to time. Specifically, for only showing the poverty of Africa in my photos and posts, which does not represent Africa as a whole. 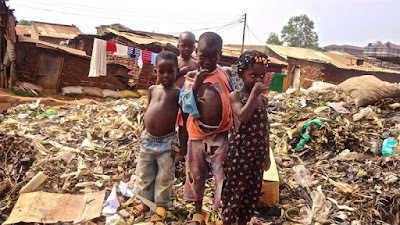 I struggle because I live in a village and spend the vast majority of my time with people that wear rags, live in mud huts, and are some of the poorest people in the world. Sure, a few times a year we go to the capital and we see stores that are similar to what we have in the States. But it is such a remarkably small part of my life, it does not seem to merit note. My goal is to share my life and the needs of our neighbors with our supporters and friends. I definitely try to share the positives of our life (the work of the Church here, the blessings of generous neighbors, our pastor is amazing, etc. ), but as a whole we are surrounded by physical and spiritual poverty. I have never claimed to represent all of Cameroon, let alone Africa. But I believe what I present to be accurate. I am not trying to be contrary, just hoping to share a different perspective. Thanks for writing and helping us see your perspective as well. David, your experience is precisely what I am saying in my article...that context matters. Sorry about the criticism you have received. I hope that my article helps to shed some light as to where the criticism might be coming from. Continue to serve the Lord and invest into the lives of the people whom you are serving. Well stated. One of the biggest problems with social media is the lack of a "context" since you cannot know who will be reading your posts. Thank you Pastor for sharing. I remember sharing a picture of two little boys who are the children of a dear friend and brother of ours in Mongu. Their clothes were worn and tore, they lived in a masasha house, and their father was the caretaker of the youth centre we were working to help start. But he was and is much more than that. He is a godly man who witnesses to those in the community who come to the youth center borehole for water. He serves faithfully in his church and often translated for the Pastor and for me. He loved helping my wife and I SiLozi. His boys loved helping us set up for events and doing work around centre with us. We would stop and let them show us their football skils or play fetch with their dog. We love them dearly. We posted their picture on Facebook and had people back home in the USA comment about those poor children. That's when I realized how things can be so misinterpreted. We did not see those boys as anything other than happy, blessed, children who we considered family. We by no means meant to cause embarrassment to them or anyone else. We simply wanted people to see the faces of these kids we loved just like we would have relatives back home. From that point on, we always tried to be very mindful of how we portrayed Zambia and its people and how it might be perceived. We love for our friends to see the beauty of everything from Manda Hill at Christmas to the fishing village along Lake Kariba. Thank you again for the reminder as we prepare for a trip in February to Uganda to work with our brothers there. I pray any pictures and post will be honoring regardless of the audience.